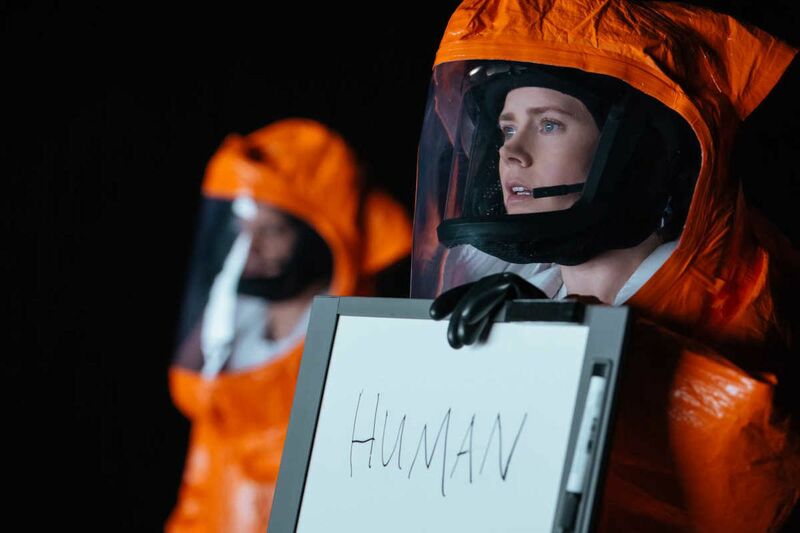 Amy Adams as Dr. Louise Banks in "Arrival." When Amy Adams enters the huge and strange alien monolith in her new science fiction saga, Arrival, she encounters a gang of extraterrestrials with long, gangly limbs bobbing through a light-filled space. They communicate by splashing circular symbols into the air, inkblotlike runes, patterns. Her character, Louise Banks, a linguist with a doctorate and a stellar reputation, has been called upon to decipher these symbols before the whole panicky world goes kablooey. At least, that's what audiences see when they watch the Denis Villeneuve-directed film. Adams, on the set last year in Montreal, saw the white light, too, but instead of a sophisticated race of aliens, she was interacting with puppeteers wielding sticks and balls. The visual effects came later - long after Adams had packed her bags and left. "We had an idea of what we were meant to be seeing," said Adams. "Denis led us through the art department and took us through the conceptual designs, which was really helpful. And he was really communicative about their movements - he described how the aliens would be in a thick mist in the beginning, so we wouldn't be able to see details, so that would create anxiety and tension." What did she think when she saw the finished Arrival for the first time? "I'm always amazed," the actress said, on the phone recently from Los Angeles. "Where we've come with CG is amazing, and how we can create these organic characters that feel real. But for me, really, what I liked when I saw the finished product was that it was as much about the tension that's built, and the score and the lighting, as it is about the computer graphics." For obvious reasons, Arrival - which also stars Adams' American Hustle castmate Jeremy Renner (a mathematician) and Forest Whitaker (a military intel guy) and which opened Friday in theaters - is reminiscent of Steven Spielberg's Close Encounters of the Third Kind. There's more than a bit of the cosmic mystery that imbued Stanley Kubrick's 2001: A Space Odyssey, too. Though Adams sees the parallels, she says neither title - nor any others - came up as reference points in her meetings with Villeneuve. "We didn't discuss any films that were inspirations," she said. "I'm familiar with all of the films that came before that influence sci-fi today, so those are in your mind. But although this film, thematically and visually, has some similar details, it felt very unique. And Denis wanted it to feel very intimate." And, indeed, it does. When Adams was first handed the Arrival script - written by Eric Heisserer, adapted from Story of Your Life, a novella by Ted Chiang - she had just come off playing Christian Bale's con-artist partner in the whirligig David O. Russell hit American Hustle. With a toddler daughter at home, all she wanted was a break. "But I read Arrival and just responded to it immediately, and then I met with Denis, and everything he said just made me more excited about the idea of playing Louise Banks. . . . He said, 'With all the science fiction, with everything else we're going to be dealing with, this is first and foremost a mother's story. This is the story that she tells her daughter.' I loved that." No spoilers here, but Dr. Banks' journey in Arrival - fraught with ticking-clock urgency and some heady stuff about the Sapir-Whorf Theory, which examines the connection between language and cognition - always comes back to the character's daughter. Adams, with a girl of her own (her daughter is now 6), could relate. "I think a lot of people, whether they have children or not, can empathize. . . . But what I think my mothering experience helped with was the scenes in between [the alien encounters], and the interactions, and being able to speak plainly to children. There's an assumption of how to talk to kids, and then there's a way that really works. That's something you have to figure out with each child as a parent." Adams has another film out this month, making the rounds of the art-house circuit: Nocturnal Animals, a lush, doomy tale about a high-end Los Angeles gallerist who lives in a manicured world and who settles in to read a novel written by her ex (Jake Gyllenhaal). The narrative toggles back and forth from Adams' character's world to the creepy noir plot lines of the book. Fashion designer Tom Ford directed the movie, which opens Friday at the Ritz Five. Much of Adams' performance is internal - the actress brims with sadness and a chilly ache. Watch her eyes. "There is a lot that is unspoken there," she said. "So I'm trying to get at the truth of who she is, her ideas. I just dug in." To that end, Adams worked with Warner Loughlin, her acting coach and friend. She worked with her, too, to prepare for Arrival. She has worked with her, in fact, off and on for the last 16 years, and continues to rely on her counsel. "It's not as though we sit down and she tells me what to do," said the five-time Oscar nominee (Junebug, The Fighter, Doubt, The Master, American Hustle). "There's a lot of work. It helps me organize my time and organize my thoughts. I'm easily distracted, so if I'm in my house and forced to work on my own, I'll be pulled into a thousand other things." Their sessions provide "a structure, a place for me to go and talk through," she said. "Sometimes, you come up against these sort of emotional blocks, and I can work through those with her. She knows my ways of distracting myself when I don't want to deal with something about a character. It's almost like bouncing ideas off of a friend." "Yeah, she's my acting therapist," Adams said with a laugh. "But I don't have her on set with me. She's come once, on set, only once, just because - well, I won't go into details, but it was helpful because the set had gone off the rails. She helped to keep me on the rails." Next up, Adams is set to start work in the spring on the HBO series Sharp Objects, based on the best-selling mystery by Gillian (Gone Girl) Flynn. Jean-Marc Vallee, who yelled "Action!" at Reese Witherspoon in Wild and at Matthew McConaughey in Dallas Buyers Club, will direct. Adams will play Flynn's troubled protagonist, Camille Preaker, a reporter who returns to her small hometown to cover the murder of two preteen girls - and also to grapple with some serious psychological issues of her own. "As the mystery unfolds, you find out stuff about her family and delve into her past," Adams said. "You know, a nice light little piece of fiction."